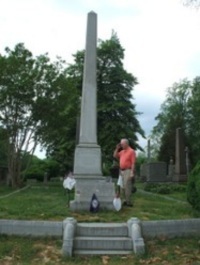 On May 2, 2009, Tom Bishop, Executive Director, Patrick County Chamber of Commerce went to Richmond and visited the grave of Maj. Gen. J. E. B. Stuart, CSA. The epitaph on the tombstone says, "They so lived in this life that in the world to come they have life everlasting." Hollywood Cemetery is a very historic burial ground and also includes other notable individuals such as, President John Tyler and President James Monroe. The cemetery, sits on a hill overlooking the scenic James River. This visit was a very moving time for me, not having been there before, and I am continuing to learn more about an extremely important personality to Patrick County's history. In Patrick County we celebrate General Stuart's birthday on February 6, and recent years have done so at the Just Plain Country Store in Stuart, VA. This is a small tribute to a man who contributed so much to our country's history during a very trying time. 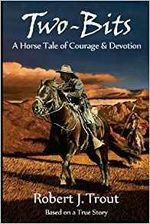 What makes the trip to Richmond so vivid in my mind is the reference to him as the "Last Cavalier", as described in the book by the same name by author Burke Davis. He only lived 31 years, but made an indelible mark on American history, as a graduate of West Point, and an inspiring soldier, who is looked up to by many today as their hero. He is truly a Patrick County hero to us, and it is illustrated by naming of the Town of Stuart and Route 58, J. E. B. Stuart Highway. We truly appreciate the life and memory of one of our own, James Ewell Brown Stuart of Ararat, Virginia.